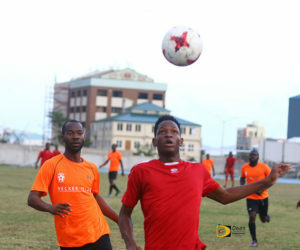 The Rebels used Michael Baptiste’s first half goal to end the Virgin Gorda Sugar Boys’ BVI Football Association Men’s League six game winning streak on Sunday afternoon at the A. O. Shirley Grounds, with a 1-0 victory. The defensive game saw the 2-1-3 Rebels punching above their weight against the 6-1-1 Sugar Boys, frustrating the visitors all afternoon. Redhead said his team was under pressure because as they’re on top of the table, everyone is aiming to beat them. Rebels’ coach Lennon Audain said his team needed the victory against a team that was unbeaten. On Virgin Gorda, One Love tied the Sugar Boys in the standings at 6-1-1, with a 2-0 victory over Virgin Gorda United, on goals by Andre Thomas and Richard Morgan. One Love’s coach Mark Savage said they played a shaky first half and don’t know if it was because they underestimated Virgin Gorda United.